BOGOHO Dinner Night – Buy one Dinner and receive another dinner half off! The second dinner must be of equal or lesser value. Purchase of two beverages required. Sorry no take out dinners. This great value is available from 11:00 a.m. to close. Purchase one dinner and get a second dinner for 1/2 off. Equal or lesser value, with purchase of two beverages. From 11:00 a.m. to close. 1/2 off of our deluxe burgers. Our most popular daily special! With the purchase of a beverage. From 11:00 a.m. to close. All you can eat Icelandic Cod…just $9.99. Served with French fries, ear of corn, salad or cole-slaw, and garlic toast. From 11:00 a.m. to close. Free Appetizer – with the purchase of two dinners at regular cost and the purchase of two beverages after 11:00 a.m.
“Super Sandwich Special” $6.99 will get you any of our sandwiches, with your choice of potato side dish, and a beverage! (Excludes premium and alcoholic beverages). Add a cup of soup for just $1.00! Daily Specials not valid with other offers. 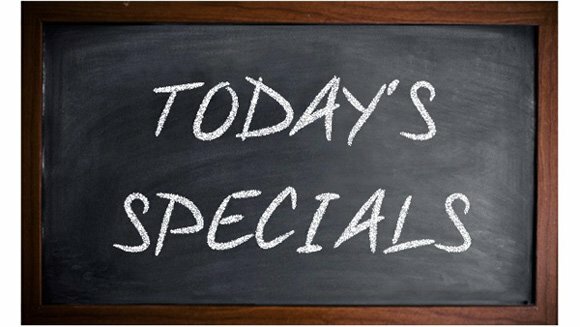 Daily specials not available for private parties, or in the VIP room.